As detailed earlier, it is apparent that the planets of the Solar System, each has its own magnet, influence the Earth’s Magnetic Core and cause it to tilt, swivel and in doing so distract some of its Magnetic force lines so they do not connect on Earth from pole to pole. 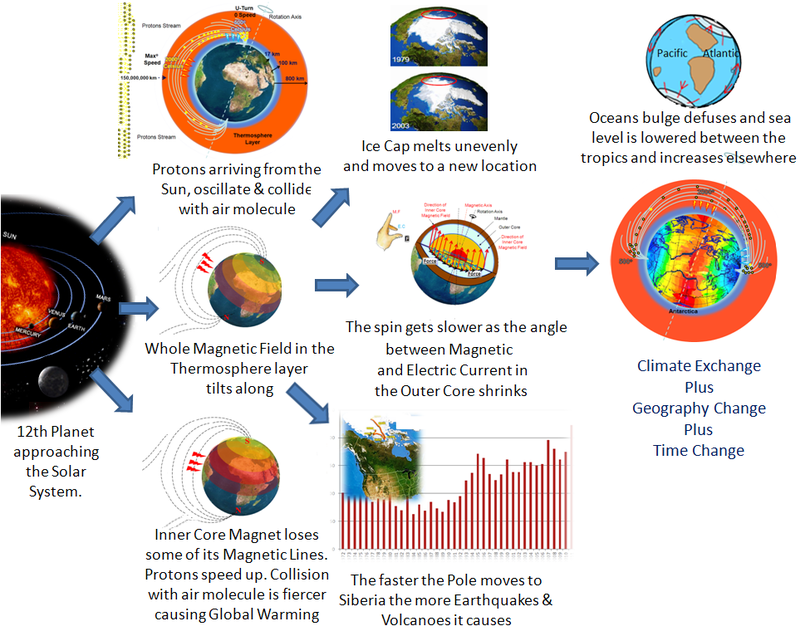 The following diagram summarizes in a cause-and-effect style, the natural phenomena that we currently observe; Global Warming, South Atlantic Anomaly, Climate Exchange, Melting of the North Pole Ice Cap, and alarming increase of Volcanoes and Earthquakes to name a few. People normally do not carry oracles’ prophecies seriously. But, could Nostradamus, through meditation and remote viewing be correct in the prediction that he made, almost 500 years ago, as he wrote in the Prophecies, Century VI, Quatrain 5? In the fear of prosecution at the time, Nostradamus has arranged his predictions in concealed quartets of poetry. Upon reading his quartet, one cannot stop wondering! Will famine emerge as a result of the heat waves that will overwhelm the planet due to increased rate of global warming? Does it tell us that the ice caps will totally melt and that the oceans will rise by the volume of the molten ice? Will there be an increase in the vaporization process so that rain will continue until the oceans lose such a surplus of water? Is that “Samarobrin” a name of a man, a machine, an organization or some other thing? One cannot ignore that the sentence has an Object but lacks a Subject and a Verb! The word “Samarobrin” seems to include the same letters as Obama, the president of the United States (2009-2012). Could it be that Obama (Subject) will sound the siren (Verb) to set the alarm for the countries one hundred league from the hemisphere (Object) to pull their act together against the Earth changes accelerating ahead? As explained in The Earth Changes Cycle, August 2017 will bring the climax of Earth Changes when the Mayna Calendar is decoded correctly. The key questions becomes how do we get prepared for an end of a cycle and a beginning of a new one? We take for granted corner-stone industries such as Agriculture, Energy, and Infrastructure. We may need to re-examine our stand, design and effect the right strategies while there seems to be sometime to get prepared. Agriculture, trade, manufacturing and financial services are the anchor industries upon which an economy flourishes. It took thousands of years to mature the agriculture industry, hundreds of years for trade and decades for manufacturing. It took less of a decade to bring a financial revolution. If history is a witness of anything, it is the cyclic pattern that governs our lives, relations, businesses. For instance, will we live through a new agriculture transformation? Climate change has started slow and is growing fast. It had, recently, compelled some forty countries to start saving grains of major crops in the fear of severe weather conditions that could lead to extension of some current plants’ species. If environmental conditions change abruptly, an immediate loss of crops will occur. One may argue that the world storage of grains could cover our needs for a year or two. There is a danger of losing stored goods due to floods, hurricanes, fires and Earthquakes. There is a danger of losing utilities, infrastructures and transportation which otherwise work in harmony to secure transfer of grains from source locations to target markets. Assuming all of the above could be managed to sustain supply versus demand, what will become of future crops? As the temperature and precipitation map of the Earth changes upon relocation of the ice caps, regions that are green in 2009 may not keep their green status anymore. Likewise, barren desert regions of 2009 could become lush and appropriate for sustained agriculture. One may imagine migrating agriculture machinery and skilled farmers to the new green regions is a matter of weeks if not months and business would resume as usual. While people living in the desert regions are accustomed to continuous travelling and relocation wherever the wealth is and have, therefore, loyalty to the head of the tribe, people living in lush regions have intimate loyalty to the land where they live and may find it hard to relocate. But, the most important limitation to a smooth transformation of agriculture is governments controlling borders. Bureaucracy developed over decades to serve and protect the community of any one land is not ready for such sudden and abrupt change. The danger of war over fertile areas and water may persist if governments do not act quickly and collaborate to build a balanced win-win relationship. It would be prudent, therefore, to strike cross-border public- private partnerships, also known as PPPs, between the governments whose lands are currently deserts but soon to turn into fertile and lush and private businesses that have the liquidity and access to agriculture experience but, due to the current economic crisis, still have no vision of where or when to right-invest. Infrastructure can be defined as the basic physical and organizational structures needed for the operation of a society or enterprise such as electricity grids, networks of water , sewage, telecommunication, or the services and facilities necessary for an economy to function, including roads, tunnels, bridges, railways, waterways, seaports, airports and so on. Governance of an organization or state that includes its bylaws, policies, processes and management system, is considered a basic infrastructure for the entity to function in a sustained manner. The health of an economy is directly related to how well its infrastructure is built, maintained, expanded and run. The supply chain or flow of material from one end (producer) to another end (consumer), for instance, becomes highly dependent on the availability, reliability and serviceability of the different layers of the infrastructure. It is common practice that redundancy is made integral to an infrastructure design. When an accident happens, an alternate route to sustain the service is made available, sometimes on full mode and sometimes on degraded mode of service. While some infrastructure owners invest in setting up a duplicate capacity that is only deployed in case of disruption, others would go into mutual disaster/recovery agreements with other infrastructure owners of same trade. A good strategy would be to expand and ensure that such agreements are executable and not only well defined and confined on paper on the shelf. It is equally important to revisit the infrastructure development projects under construction. For example, the Great Rift Valley extends from Lebanon in the north to Mozambique in the south, and constitutes one of two distinct physiographic provinces of the East African Highlands physiographic division. The northernmost part of the rift, called the Dead Sea Transform fault (DST) system, is the major tectonic feature controlling the strati graphic and structural evolution of the region since the Miocene Age. 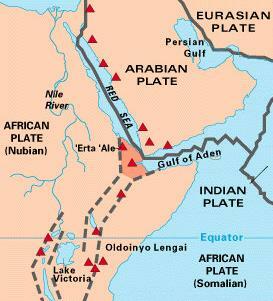 A million years ago, a major Earthquake created the Arabian-African Rift. The Dead Sea sank deep into the valley and was deprived of its natural outflow to the sea. Today, the Dead Sea is the lowest point on Earth with its surface at 400 m (1,330 ft) below sea level. Fresh water flowing downstream through the Jordan River empties into the terminal lake. Having no exit point, the Dead Sea water evaporates, causing salts to accumulate in the lake and in its sediments. As a result, the Dead Sea’s salt concentration is about 33 percent, compared to 3 percent in the Mediterranean. In the 1930s, the inflow of freshwater equaled the rate of evaporation, with the Jordan River emptying some 1.3 billion cubic meters (317 billion gallons) of clean water per year. Today, the inflow is only one-third due to national water projects on both sides of the Jordan River that have diverted freshwater upstream. As the rate of inflow from the Jordan River has decreased, so has the level of the Dead Sea. The lake’s high rate of evaporation has also contributed to its declining level. The Dead Sea drying up, therefore, brings severe negative consequences on the ecosystem, industry and wildlife in the area. There have been several proposals for a canal to transport Mediterranean Sea or Red Sea water to the Dead Sea. Such a water project would reverse the negative impacts on the environment—that is, the erosion of the shoreline and disruption of the water column caused by declining water levels. The canal would create new trade and development opportunities by using the height differential between the bodies of water to generate hydropower, a much-needed source of water for domestic, agricultural and industrial purposes. However, it would be prudent to assess the possibility of major Earth tremors and Earthquakes as discussed earlier in the book. What if, in a couple of years, such a canal is naturally entrenched! Land development and improvement does include infrastructure. Urban planning helps to optimize the cost and improve the speed of delivery of necessary civic and rural infrastructure while keeping the functional intention of the development intact. As a result of the sudden melting of the ice caps, the rising sea level is unavoidable, as are tidal waves that accompany the sudden discharge of molten ice into the ocean. It became apparent that future urban planning codes should minimize coastal cities. Instead, cities are better developed at least 15-20 km (9-12 miles) away from the coastal line or at 100 to 200 m (330 to 660 ft) altitude from the sea level. Energy sources span from fossil, hydraulics, and nuclear to the latest sources of renewable energy. Earthquakes can hardly change the position of a coal mine. However, depending on the severity of the quake, an oil basin may leak its reserve if sediments cracks are deeply rooted and tunneled to other empty cavities and basins. The map detailing changes in climate and temperature would lead to a new pattern of water distribution. Hydraulic power plants erected on the path of abundant and rich water rivers may cease to operate if water flow dries out. Careful relocation of such plants could resolve the issue, but this would consume time and resources, as would, erecting new power grids to carry the resultant electrical current from the new locations. Renewable energy plants based on wind turbines, thermo or photovoltaic panels must follow the new meteorological map of the planet. Relocation could be carefully carried out, but in the absence of profitable returns on investment of renewable energy technologies at the current moment, such relocation may not come as a priority. It seems that nuclear power plants are the least impacted by a changed meteorological map. The design of such power plants, in most cases, has already taken into consideration Earth tremor and Earthquakes. However, safe shutdown procedures should be reexamined for severe, repetitive and prolonged tremors. When we look at the Sun casually, it appears to be a uniform, unchanging star. Scientists and engineers have a very different perspective. To them, the Sun is a dynamic, chaotic, and poorly understood caldron of thermonuclear forces, one that can spit out fierce bursts of radiation at any time . And when Earth lies in the path of that blast, the flare can play havoc with power grids, disrupt radio communications, and disturb or disable satellites. Fifty years into the space age, Earth has avoided the worst the Sun can deliver, so far. But with the Sun entering a period of increased activity, more frequent solar flares could be headed our way. With the collapse of the magnetosphere, are satellites and power grids ready to cope up with the increased rate of solar flares mass-energy? “Solar flares are a product of the Sun’s complex chemistry”, says Haimin Wang, director of the Space Weather Research Lab at the New Jersey Institute of Technology in Newark. The internal processes of the Sun create whirlpools of magnetic force, which slightly lower the surface temperature of the Sun, causing what we see as Sunspots. As referred earlier, the stronger the magnetic field the slower solar mass particles can oscillate at the thermosphere layer and accordingly less radiation energy and temperature is observed. Every eleven years, the Sun flips its magnetic north and south. This swap churns up an increased number of Sunspots, with the next volatile peak due in 2012. Magnetic energy can build up on the solar surface and then suddenly be released in a massive burst. This flare, a wave of particles moving near the speed of light, arrives at Earth shortly after the light itself, which takes about eight minutes to cross the 150 million km (93 million miles). In other words, sky-watchers won’t know there has been a solar flare until shortly before the radiation arrives. The burst is largely cushioned by Earth’s magnetosphere. Because of magnetosphere padding, the burst poses little risk to people on the ground. However, airplanes at high cruising altitude and spacecraft are much more vulnerable with the weakening of the magnetic field. Although is based on a theory that the magnetic field that protects the Earth is generated at the Outer Core, which I am not in agreement with as explained and manifested earlier; but the film; The Core offers a speculative view of this situation.In the film, a severe electromechanical failure takes place. Equipment is broken and planes are crashed. In an analogical view, the Sun flare can zap electronics on satellites, which lie entirely in vulnerable magnetic zone outside the Earth’s atmosphere. While this initial burst can be dangerous, there’s a much slower wave of energy – a coronal mass ejection (CME)—that can seriously disrupt electronics. Not every flare produces a CME, and they often occur when no flare is present. When they do spew out, CMEs send strong waves of protons to the Earth. The most visible signs of this are the colourful northern and southern lights. But, a CME can also have more serious consequences. For one, it can cause electrical transformers to trip or fail, which can lead to widespread power outages. A particularly powerful CME storm hit Earth in 1921, before electricity played as big a role in daily life as it does now. If a burst of similar magnitude hit today, it would interrupt power for as many as 130 million people, (National-Acadmy-of-Sciences, 2009). In 1989, a geomagnetic storm knocked out power to 6 million people in Quebec. CMEs also can cause the Earth’s atmosphere to expand temporarily. This can cause low-orbit satellites, such as the constellation of Global Positioning System markers used for navigation, to drag in the denser air. Combined with changes in the transmission of radio waves caused by CMEs, this can lead to errors in positioning. The magnetic field also can induce glitches or even damage satellites. Ron Mahmot, who manages the Satellite Operations Control Center for the National Oceanographic and Atmospheric Administration (NOAA), isn’t particularly concerned about potential damage from solar activity. NOAA has had only one satellite damaged by a solar flare. The 1994 incident merely shortened the life of the orbital weather-watcher; it did not totally disable it. And for the most critical NOAA satellites, those that monitor the United States from geosynchronous orbit, there is an on-orbit spare in place, with more still to launch. Dr. Guhathakurta of NASA is less certain: “In the past, satellites were built with much greater integrity”, she says. “Now we’re putting up so many satellites, and the electronics are changing. I don’t believe the electronics are as well tested for radiation as in the past”. Part of the problem, she says, is that we don’t know what the most powerful solar flare might look like. And even if 2012 brings a mild solar peak in terms of quantity, the power of the flares is not directly associated with their number. If an orbiting planet that follows an elliptic path around two suns, as demonstrated in chapter three, circulates our Sun at very high-speed, the magnetic pull of such a planet may not only increase the number of flares, but also increase their magnitude and outreach. The bulged weaker magnetosphere would bring less of a shield to protect the Earth from the charged particles of the Sun. As we discussed earlier, magnetism is one of the forces in which materials through monopole photons exert attractive and repulsive force or moments on other materials. Some well-known materials that exhibit easily detectable magnetic properties are nickel, iron, cobalt, gadolinium and their alloys. These substances, when charged, are known as magnets. All materials are influenced to greater or lesser degree by the presence of a magnetic field. Substances which are negligibly affected by magnetic fields are known as non-magnetic substances. They include copper, aluminum, water, and gases. Most generators and motors have magnetic components. The interaction of magnetic force lines and electric current produces motion, as in the case of a motor. Equally, the interaction of magnetic force lines and motion produces electric current in the body in motion, as in the case of a generator. Motors and Generators use ferromagnets, which keep their magnetization in the absence of an electric field. Motors and Generators also use electromagnets that acquire their magnetization only when electricity flows in a surrounding coil. Neighboring pairs of electron do spin to point in opposite directions. This property is not contradictory, because in the optimal geometrical arrangement, there is more magnetic moment from the sub-configuration of electrons which point in one direction, than from the sub-configuration of electrons which points in the opposite direction. Thus, a net magnetic force in the direction of the geometrically prevailing electron’ spin is produced. We currently know that every ferromagnetic substance has its own individual temperature, called the Curie temperature, or Curie point, above which it loses its ferromagnetic properties. Fortunately, this temperature is forty times the room temperature at 1 bar pressure, otherwise, ferromagnets would lose their magnetic properties every now and then and motors and generators would become highly unreliable. The magnetosphere is over bulged and weakened as its force lines are re-routed to meet up with the magnetic force lines of the ninth planet. The swarm of charged particles of the solar storms, such as positrons, and protons, that are in plasma state, will find it easy to invade the magnetosphere. It will bathe all metals including ferromagnets, hunt the pairs of free electrons and destroy the spin imbalance of the electron pair configuration. Lesser pairs of free electrons lead to lesser magnetic force and failure for the metal to act as ferromagnets. Equipment that uses ferromagnets and electromagnets to function will cease to operate. I suggest shielding the electronic boards, motor magnets, and generators magnets by non-magnetic substance that shields such plasma-state protons and positrons away from the magnets. As scientists gather more information, satellite companies have a few tricks to protect their space-bound electronics. It is hard to determine the effectiveness of shielding, mostly because experts don’t fully know what the Sun is capable of spewing out. Another satellite defense would be “safe modes”, in which administrators turn off most of the on-board electronics to protect them from going haywire. This can save the satellite but would interrupt whatever services it offered. Safe modes also require some kind of early warning; the technology for this is nascent at best. Planet life is very vulnerable to changes in diet, habitat temperature and reproduction processes such as following certain migratory paths at certain times of the year. If the food chain is broken due to extinction of some species, and if no alternative is made available, the whole life chain on top could face elimination. Climate change may drive a quarter of land animals and plants extinct, according to a major new study (Thomas & Hannah)  While the study attributes the cause to rising planet temperature due to greenhouse gas emissions—which, according to my earlier analyses, could not be the prime cause—there will be drastic and swift changes in the habitats of most species. The largest consortium of scientists ever to apply themselves to this problem studied six biologically diverse regions around the world representing 20 percent of the planet’s land area. They projected the future distributions of 1,103 plants, mammals, birds, reptiles, butterflies and other invertebrates. The study employed computer models to simulate the ways species’ ranges are expected to move in response to changing temperatures and climatic conditions. Using data supplied by the Intergovernmental Panel on Climate Change in the USA, the scientists considered three different climate change scenarios: minimum, mid-range and maximum expected climate change over different regions of Earth. They also considered the ability of animals and plants to move to new areas, using two alternatives: one in which species could not spread at all, and the other assuming “unlimited” or successful movement. The study found that 15 to 37 percent of all species in the regions considered could be driven extinct from the climate change that is likely to occur between now and 2050. However, the computer, should be re-visited in connection with abrupt rather than gradual change. The scientists believe that extinctions due to climate change are also likely to occur elsewhere. “If the projections can be extrapolated globally, and to other groups of land animals and plants, our analyses suggest that well over a million species could be threatened with extinction as a result of climate change”, said lead author Chris Thomas a biologist at the University of Leeds, England. So what could be done? We can reflect on the lessons of Noah’s Ark. We have also heard of the efforts of some forty countries of the western hemisphere to store samples of most if not all kinds of grains currently available. Could a similar effort be made to include all plants and animals? Fish and mammals at sea will be able to relocate more freely. However, they will suffer severe oceanic volcanoes that rip the Crust open, spewing lava at sea. They will get stranded in pockets of water or dead-ends as well as shallow creeks if they rely on Earth’s magnetic force lines, hardly predictable, to guide them navigate at sea. A study, at the University of Florida (DeSantis) , shows that mammals change their dietary niches based on climate-driven environmental changes. The study contradicts a common assumption that species maintain their niches despite global warming. Led by Florida Museum of Natural History vertebrate paleontologist Larisa DeSantis, researchers examined fossil teeth from mammals at two sites representing different climates in Florida: a glacial period about 1.9 million years ago and a warmer, interglacial period about 1.3 million years ago. The researchers found that interglacial warming resulted in dramatic changes to the diets of animal groups at both sites. Co-author Robert Feranec, curator of vertebrate paleontology at the New York State Museum, said that scientists cannot predict what species will do based on their current ecology. “The study definitively shows that climate change has an effect on ecosystems and mammals, and that the responses are much more complex than we might think”, explained Feranec. “The two sites in the study, both on Florida’s Gulf Coast, have been excavated quite extensively”, said DeSantis. During glacial periods, lower sea levels nearly doubled Florida’s width, compared with interglacial periods. But because of Florida’s low latitude, no ice sheets were present during the glacial period. Despite the lack of glaciers in Florida, the two sites show that dramatic ecological changes occurred between the two periods. Both sites include some of the same animal groups. The research examined carbon and oxygen isotopes within tooth enamel to understand the diets of medium to large mammals, including pronghorn, deer, llamas, peccaries, tapirs, horses, mastodons, mammoths and gomphotheres, a group of extinct elephant-like animals. Differences in how plants photosynthesize give them distinct carbon isotope ratios. For example, trees and shrubs process carbon dioxide differently from the way warm-season grasses process this gas, resulting in different carbon isotope ratios. These differences are incorporated in mammalian tooth enamel, allowing scientists to determine the diets of fossil mammals. Lower ratio values suggest a browsing diet (trees and shrubs) while a higher ratio suggests a grazing diet (grasses). Animals at the glacial site were predominantly dieting on trees and shrubs, while some of those same animals at the warmer interglacial site became mixed feeders that also grazed on grasses. Increased consumption of grasses by mixed feeders and elephant-like mammals indicates that Florida’s grasslands likely expanded during interglacial periods. To find these signatures, researchers run samples of tooth enamel through a mass spectrometer. “When people are modeling future mammal distributions, they’re assuming that the niches of mammals today are going to be the same in the future”, said DeSantis. “That’s a huge assumption”. Civil order has been developed over centuries of elaboration and speculative approaches. The crafting of laws, policies, regulatory and controls led to delivery of sound services on the government, public and private levels. The eventual application of information technology enabled societies, communities and companies to prosper through transparent, spontaneous, correct and effective services. The Internet seemed to have kept a good and growing memory of knowledge to support more effective decision-making, collaboration and communication. All that is required, for a police officer who wants an assurance that the correct procedure is being applied, is to type an inquiry at a networked computer. The officer would also go through online criminal records to limit the search for suspects and become more responsive in closing a criminal case. What if the officer, as it was half a century ago, had to look into textbooks, manuals and piles of papers and mug books of suspected persons? Would he or she be trained to do that efficiently (quickly) and effectively (exhausting all possibilities that are pertinent to the case in hand)? Probably not! Communities’ expectations would have to be set realistically low. It would be some time before recovery and reestablishment of computer storage, processing and networking capacities occurred. It is prudent to set and test strategies for data protection and disaster recovery procedures. Scenarios of manual operation must be laid down, and service officers must go through training and a learning curve of operation and probably communicating using disciplines that have otherwise been extinct for more than 100 years. A national security team will typically include any one country Department of Defense, the intelligence community and allies. Industrial security will have to include critical infrastructures as well as government and nongovernmental organization services. Civil security would be typically led by the Department of Homeland Security, working hard to maximize law enforcement. The network of those three teams must be continuous, shared and prepared to protect communities from key threats and dangerous events. The human element remains the key factor to ensure that i) legal codes are adhered to, ii) public infrastructures are resilient and redundant through either additional resources or bilateral agreements, iii) the economy is prepared to handle shortages and cut off routes, and much more. It is crucial to revisit the immigration control policies in anticipation of potential and massive human migrations. After the storm is over and a new ecological map of the planet emerges, borders may be used to delineate only differences in language and deep-rooted traditions. Lead country projects, is a simple concept where each country of the world is assigned a leading responsibility or a set of leading responsibilities to manage the preparation and transformation during Earth Changes. As in every successful project, a timely, quantitative, and qualitative vision is defined and agreed upon by all involved. There follows, the organization of every project, wherein a lead country has a set of responsibilities and led countries have complementary and supporting ones. The utilization of information technology is a must to provide instantaneous data and information sharing round the clock and across the planet. While such projects assemble and embrace the expertise, knowledge and wisdom of project managers, industry experts and those who maintain community relations, there should be a pool of shared services and competence in finance, human resources, legislation, logistics, and technology. I believe that the human race draws closer at times of calamity. In the likely event that wars will cease to exist for a good period of time, the United Nations, could, reinvent itself for a period of time, as the Policy Maker, stating the rules and guidelines that will aid the transformation. 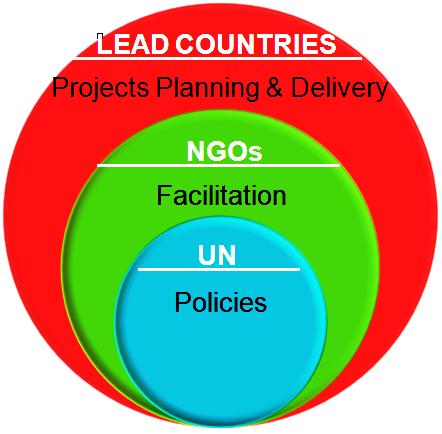 nongovernmental organizations (NGOs) could play facilitator roles in such global and cross-country projects. The United Nations climate change conference in Poznań concluded in December 2008 with a clear commitment from governments to shift into full negotiating mode in order to shape an ambitious and effective international response to climate change, to be agreed upon in Copenhagen at the end of 2009; which did not turn out to be a success. The core of all discussions and negotiations must change from a narrow view to set rules and quota to control carbon dioxide emission. As presented earlier on this site, carbon dioxide increase is not manmade. Instead and based on the actual cause, the effort should be exerted to draw a holistic time view on Earth changes and to lay down strategies, projects and roles to minimize the impact of such changes. New national and international policies, changing consumer preferences and emerging markets in response to climate change are stimulating new trade and investment opportunities. Such opportunities are being picked up by big business, but small to medium size enterprises are structurally disadvantaged and poorly prepared to seize the new opportunities. However, the main issue is that most investment opportunities are focusing on low-carbon solutions and the creation of green collars jobs. A just call but far from right as ‘0’ carbon emission will not stop the Earth Changes that is caused by purely natural and cyclical phenomena. The urgency of the matter calls for humankind to revisit its priorities and direct the funds and resources to the right cause: setting a simple and achievable set of strategic actions and keeping societies and communities aware and supportive of the progress. There should be no independent gain for any one country or any single community or person. A global problem mandates a global solution. Let us take an example and ask what could, a global solution to a world-wide famine scenario be? The World Trade Organization is working to close the Doha round of trade negotiations so that a consistent trade policy is applied across the countries of the world. The round should reduce subsidies, and would lower tariff walls in developed and developing countries. For the food sector, this means bringing food closer to the poor. The discussion may take forever as it touches on hundreds of countries, thousands of categories of traded products and services and millions of permutations of components country of origin. I believe that climate change impacted goods and services should be singled out of such prolonged discussion and be given an absolute top priority in the round of trade negotiations to conclude fast and get adequate flow and distributed storages of necessary crops enacted ahead of time. We can never be sure of roads and transportation availability when the time comes. Gain should be collective and for all. We live on a single ship called Earth. A hole in one corner will cause it to sink, and those on board will share same destiny no matter how high they stood. We should understand the past, study the present and be prepared for the future. At the tail of every end there is always a new beginning. The underlying theme at the conference, in which I presented Earth Changes, was to call for “Climate Justice” by asking the developed countries to help developing countries financially and technologically since it is believed that the developed countries are behind increase in carbon emission which, according to many scientists, lead to global warming and climate change. I explained that through geological records it was found that CO2 rise follows that of the Temperature on the surface of the planet and not vise versa. And I elaborated more profoundly on the Earth Temperature illustrating the true drivers behind increase in global temperature. My recommendation to the panel was to replace “Climate Justice” by “Climate Partnership”. The climate abrupt change in years to come would mean that arid land shall become fertile and vice versa. It is to the interest of both developed and developing countries to build cooperation agreements and protocols to secure food by fast redeployment of agriculture expertise, technology, best practice and funds. http://features.csmonitor.com/innovation/2009/05/05/solar-storms-ahead-is-Earth-prepared/ Solar storms ahead: Is Earth prepared? Thomas, C., & Hannah, L. (2004, July 8 ). Science News. Nature .